LiveGrade Pro allows to link slots and sync image processing nodes between slots. Thus it is possible to build two independent processing chains that can contain unique as well as shared processing steps. …help you understand the basic principles of Linked Looks in LiveGrade Pro. …teach you how to link slots and sync nodes. …give you insights how to handle Linked Looks in the library and for export. 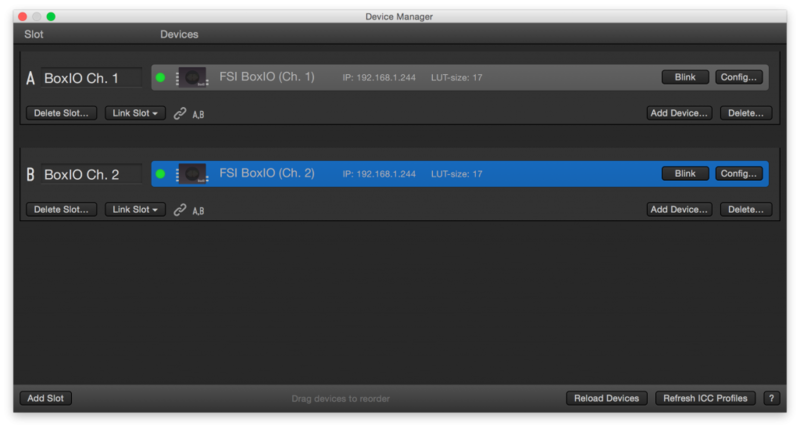 If you are not familiar with the device manager and the basic use of slots in LiveGrade please visit the article Slots View and Device Manager. The basic idea of the Linked Looks feature is to control two slots at the same time. Also important is being able to adjust parts of a look separately and other parts simultaneously. 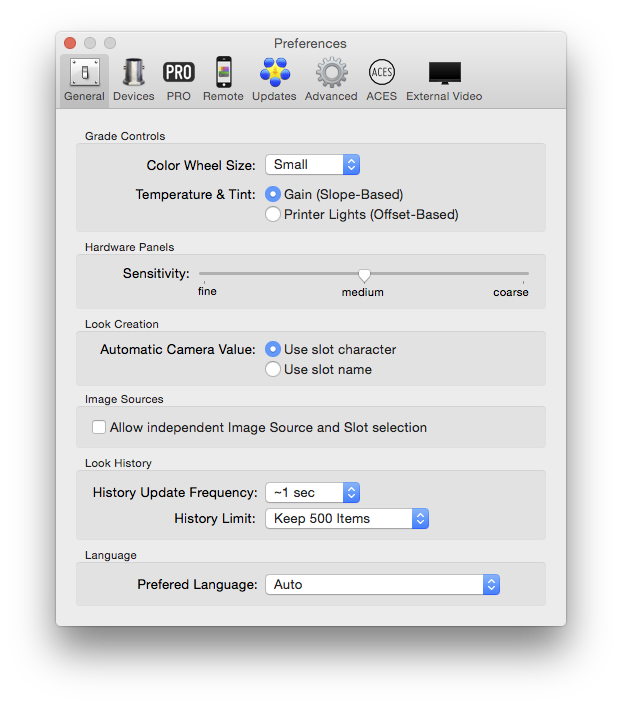 While two or more devices are involved you can adjust certain parameters of the look simultaneously for all devices while other parameters can be set uniquely for each device. By linking slots you decide which two or more slots will synchronize nodes between each other. 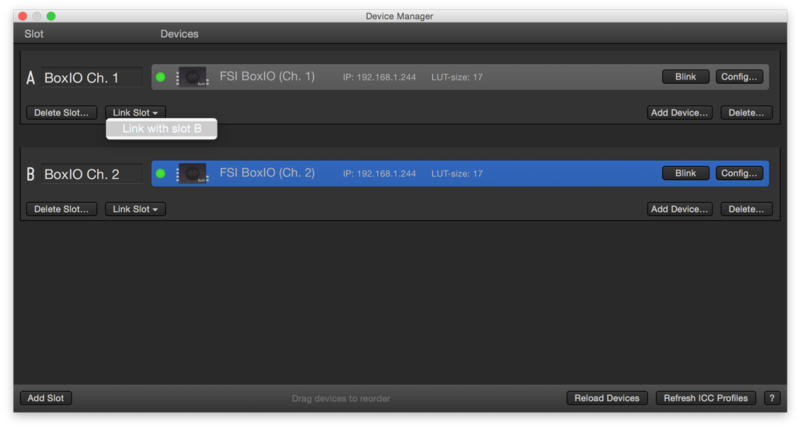 Then you can decide which nodes to sync and which not to sync. Fig. 3: Two linked slots A and B for BoxIO in dual channel mode. The slots view on the left side of the main UI of LiveGrade will also show the chain icon accompanied by the slot characters of all the slots that are linked. Fig. 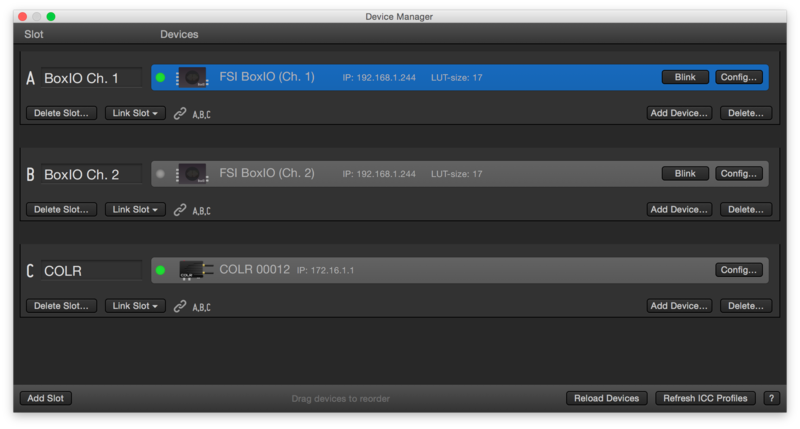 4: Three linked slots with three devices A,B and C.
Close the Device Manager to go back to the main window of LiveGrade. You can switch the linked state of a node by clicking on the chain buttons. You can now switch between the two slots to build your look with synced and unsynced nodes. If you have a node unsynced and change its setting, it will only change in the edited slot. If you then click the chain icon to sync it with the linked slot the settings of the node will simultaneously be applied to the according node in the linked slot. When you connect slots they will always keep the same grading mode and exact same node structure in the grading panel. If you delete a node from one slot it will also be deleted from the linked slot and vice versa. The same behavior takes effect when adding nodes. Fig 6: Creating a new Linked Look in the library. When you have two or more slots linked the stored look will contain the node structure for both slots in the exact configuration at the point of time you stored them. If you apply a look from the library that was saved in linked slot configuration it will restore the same node structure and the same sync status and setting of the nodes and slots you configured before. You will be able to identify linked looks by taking a look at the “Linked Slots” column. It contains the information about the linked slots. It is easily detectable of how many independent looks the linked looks persists of and from which slots they were saved. Fig. 10: Slot name in Linked Looks column. 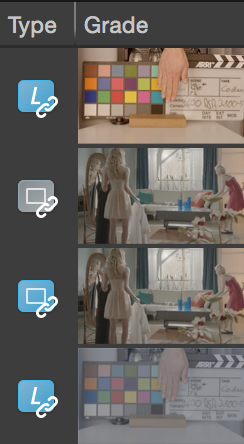 You can split linked looks up into their separate, standalone looks. The Linked Look consists of several standalone looks that come from the different slots. For each slot a standalone look is stored as part of the linked look. The number of standalone looks that will be created is easily predictable by the number of slots the Linked Look possesses (see also Linked Slots column). The Linked Look stays in the library unaltered. 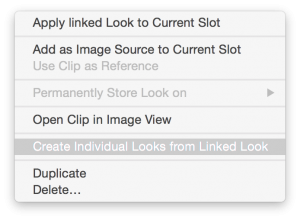 From the context menu choose “Creating Individual Looks from a Linked Look”. You will then receive two or more standalone looks depending on the number of linked slots. Fig. 12: A Linked Look with the standalone looks it consists of. The example in fig. 12 shows a Linked Look (“Linked Look 2”) and the result of creating individual looks from it. The resulting standalone looks receive individual thumbnails and the slot name from the Linked Nodes column. Therefore the Linked Slots column is empty, which is always the case for standalone looks. 3D LUTs: Linked Looks will be exported to all LUT formats by splitting up the Linked Look into its different standalone looks. ASC-CDLs (.cdl): For each standalone look one .cdl file will be exported. 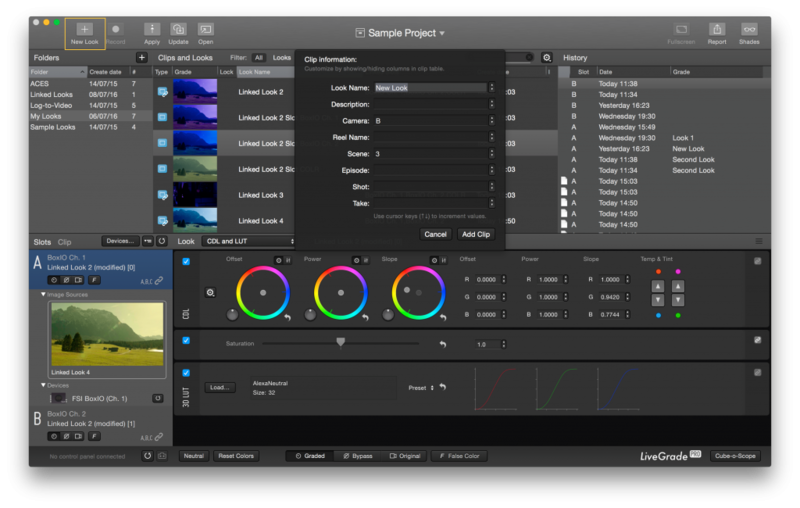 Pomfort Look (.pfl): As for the 3D LUTs the look will be split into its standalone looks. Similar to creating individual looks from Linked Looks the export functionality with linked looks will always add “Slot” and the character or slot name (depending on preferences) to the end of the file name. A Pomfort Look Archive can be exported including Linked Looks. A compatible version of LiveGrade will be able to import the Look Archive again including the intact Linked Looks. Importing the Look Archive into Silverstack will result in standalone looks in the Silverstack Look Library. Learn more about exporting a Pomfort Look Archive from LiveGrade and the look transfer to Silverstack from the article Transferring Looks from LiveGrade to Silverstack.